For many people there is quite a bit of stigma associated with therapy. 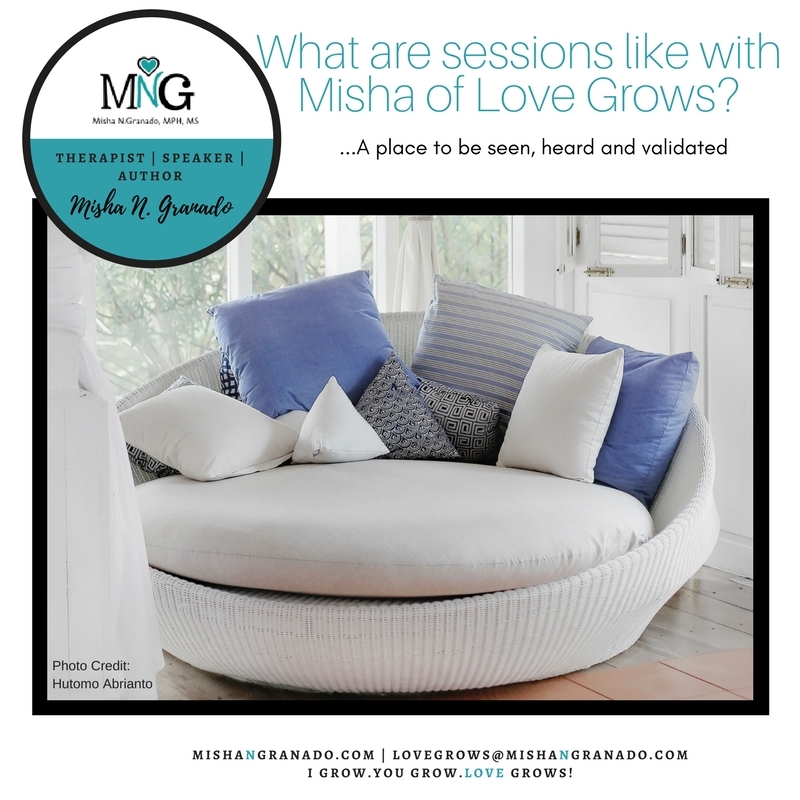 In attempts to provide a different perspective on therapy, we are beginning a new series, “What Are Sessions like with Misha of Love Grows” that will run for the next few weeks. If it doesn’t break up, it makes you stronger. If the door doesn’t open, it’s not your door. You cannot change your past, so get over it! If she/he doesn’t want you keep it moving. While these are true, it does not negate the emotional hurt you feel in the moment. Someone quoting these statements or suggesting that you emotionally ‘pull yourself up by your bootstraps’ does NOT expedite your healing. Suggesting that someone is weak because they actually feel and articulate their pain does not help the situation. Questioning a man’s sexuality or masculinity because he expresses his emotions does not create a safe space for him and builds a wall between him and you. This is applicable to both men and women, girls and boys. We are human and even though boys/men (generally speaking) have not been given the safe space to explore and express the ENTIRE gamut of emotions, they also feel and need the space to express. In some communities boys learn quite early that they have 2 emotions (happiness and anger) they can express WITHOUT their sexuality being questioned. This is perpetrated by both men and women in the child’s life. For example, a 2 year old girl and boy child tumble down, the girl is often coddled, hugged, kissed and allowed to express her emotions. Whereas, the boy child is told, ‘Get up! Nothing is wrong with you! I’ll give you something to cry about!’ This is where the stuffing begins. This does not mean boys do not FEEL all of the emotions as girls, it just means they were not given years to practice. Fast forward to adulthood, you have men who do not know how to express their feelings in a healthy way. They cannot articulate to their significant other what they are REALLY feeling, because they do not have the words or many not even know how to quantify the emotion because all they have even been safe to express and articulate is anger and happiness. He may know what he is feeling definitely isn’t happiness. He doesn’t think it is anger. So what is it? Sessions with me are a safe space where both women and men are free to express their feelings. The Love Grows sessions are a judgment free zone. Instead, it is a place where emotions are celebrated because I know the more you feel the closer you are to healing…and healing is the ultimate goal of our sessions. Life is meant to be experienced through ALL of your senses and domains. Are you living a life where you are allowing your heart to fully expand? 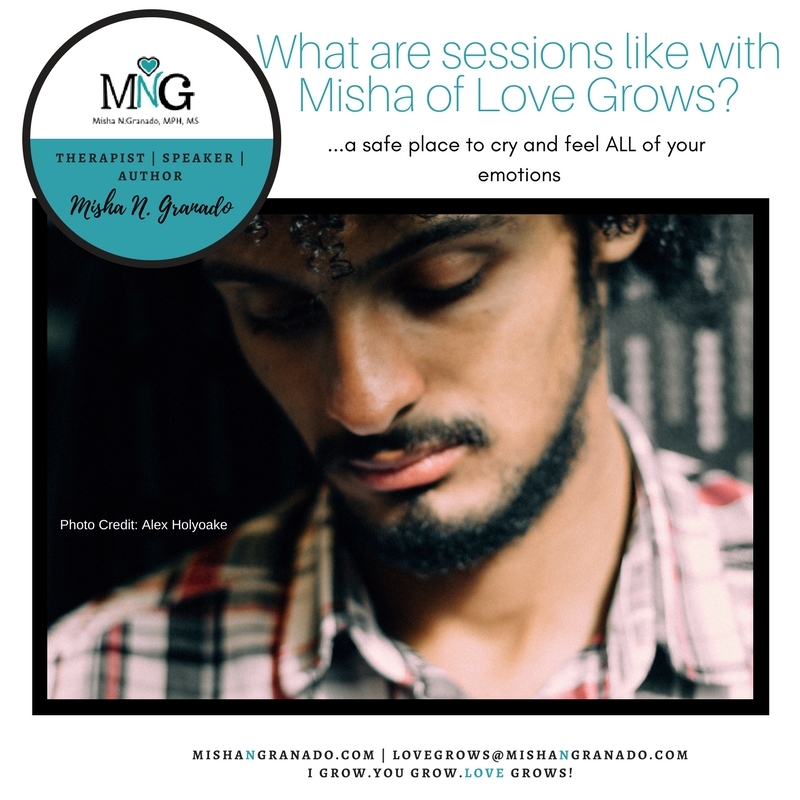 Sessions with Misha will teach you how to expand your heart and heal your mind. Sessions with me are like a conversation where you are seen, heard and validated. A safe place where you can articulate your thoughts and feelings and when needed I will gently encourage you to find the words or in some cases draw or even act out what you are feeling. One of the most endearing qualities about me and my sessions is that it is a non-judgment zone. I understand and respects that everyone, absolutely everyone is on their own journey and view it as an honor that you invited me onto your path and trusts me with this sacred space.